And A Player To Be Named Later: What If The Yankees Miss On Cliff Lee? 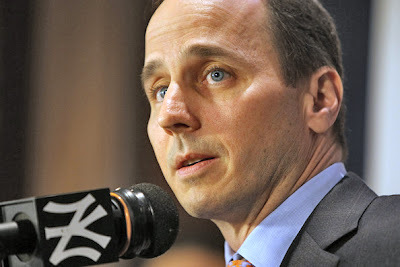 Brian Cashman said yesterday that last winter’s moves weren’t his best off-season moves. “I didn’t have a great winter last year,” the general manager said. “A lot of the things I wound up doing didn’t benefit us as much as I wish they would. Some didn’t benefit at all.” Readers of my writings know that to that I would have to say this: No duh. Well, that was then and this is now. So what do the Yankees do this off-season. Pitching, Cashman said, is the most important area to address. Again: Duh. 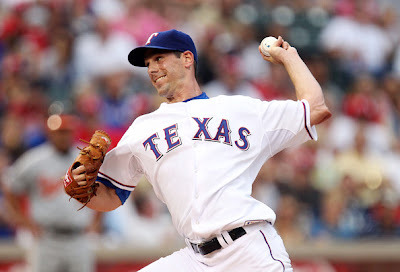 To get Cliff Lee—the Yankees’ (and half the league’s) priority—the Yankees would have to ask the Treasury Department to print more money just so they can give it to Lee. Now, of course, Lee would look very nice in the Yankees rotation—a rotation that looked cracked in the playoffs and plainly needs shoring up. The Yankees would jump for joy if Lee agreed to come to the Bronx, even if they had to pay Lee, who turns 33 next season 20+ million until the age of 39 or 40? A bit of a scary thought. But even scarier than that is this: what if the Yankees don’t sign him? What if Lee decides to stay in Texas, or heads to the Cardinals or someplace else? Then what do the Yankees do? After Lee the free agent pickings are “slim” and “none.” And “slim” left town. The trade market awaits. Zach Grienke is a name that gets bounced around a lot. However Grienke comes with some concerns. First off, after his Cy Young year in 2009, his ERA jumped 2 full points last season to an unremarkable 4.17 and his K/9 dropped 2 Ks per game. Maybe he bounces back tucked into the Yankee rotation, but what if they weren’t an aberration, but the start of a decline? As if that wasn’t enough to consider, figure this: As Jon Heyman rightly brings up: Grienke has in the past had anxiety problems and depression. The Bronx spotlight may not be the right place for a guy who might be ill equipped to handle it. The Braves have been looking for quality outfielders since seemingly since the franchise was in Boston. Melky Cabrera didn’t cut it, Nate McClouth was a fail, as was Rick Ankiel. Outside of rookie Jason Heyward, the outfield was a tag-team disaster. The Yankee’s Nick Swisher’s .511 slugging percentage would be highest on Atlanta’s 2010 team and his 29 HRs would be 8 higher than the next Brave. Swisher would solidify the right field spot for some time to come. The Braves have more than a few options for the rotation including blue-chip prospects Mike Minor and Craig Kimbrel and Kris Medlan. 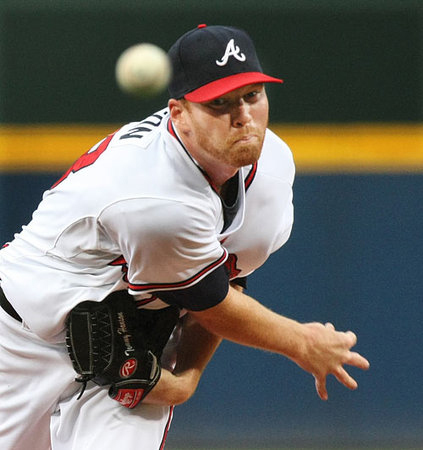 So, would a Swisher, Gardner and Gary Sanchez package be enough for Tommy Hanson? Of course the Braves would try to replace Hanson with Derek Lowe instead (Good God, no), but with enough talent in the trade package, and enough young pitching for the Braves to fall back on, maybe the Yankees could get the talented Hanson. Of course, trading both Swisher and Gardner would leave the Yankee outfield thin—which would immediately put them at the head of the table for going after Carl Crawford, using the money they were going to spend on Lee. Then does Montero spend time in right field, or maybe Brandon Laird makes the jump? Or maybe the Yankees resign Melky Cabrera for the outfield (making Cano very happy). Or maybe the Yankees could get by with a Thames/Hinske/Golson platoon—Ugggh. Oakland’s Billy Beane loves 2 things: inexpensive young players and on-base percentage. And with an embarrassment of young pitching, perhaps a trade of Brett Gardner (8th in the AL in on-base percentage) Zach McAllister and Eduardo Nunez could get Trevor Cahill or Gio Gonzalez? The A’s had 85 wins last season—and improvement to their team 109 HRs and .358 slugging percentage could help them move into AL West contention. And after giving up, say, Gonzalez, they would still have, Braden, Cahill, Anderson, Mazzaro and AAA prospect, Clayton Mortenson. Or perhaps the Yankees could get a guy on the cusp—a AAA blue-chipper they could plug in behind Sabathia and Pettitte. The Mariners have one rock-solid ace in King Felix and 3 quality pitchers behind him. And considering all-universe minor-leaguer Michael Pineda is slotted to be a part of the Mariner rotation next year—and that the Mariner lineup was beyond deplorable—Seattle might be open to a trade with the Yankees for Luke French—their not-quite as talented quality AAA pitcher? French projects to be a 3-4 starter in a big league rotation, so heck no, he’s not Cliff Lee, but French did have a 1.165 WHIP and 2.98 in AAA this past season. So would Nick Swisher, Kevin Russo and highly regarded prospect low-A prospect Ramon Flores be enough for French and another prospect? Or how about Austin Romaine and Joba Chamberlain for French and a quality prospect? Then Ivan Nova and French can battle for the 5th spot in the rotation. Again, not as good as Cliff Lee, but a not-so-bad option. And remember: the Mariner with the most home runs had 15. Swisher, at 29, had almost double that. Ichiro had the highest OPS+ on the Mariners with a 113. Swisher had a 130+. And Chamberlain would love Safeco’s large confines and smaller spotlight. Some form of this trade might make sense. Of course this is just fun conjecture—some early hot-stove silliness. But the reality is, Lee might not want to come to Yankee Stadium and pitch in the stress hot tub that is the Bronx. So the Yankees need contingency plans. And considering the Yankees are not known for allowing prospects a lot of time to battle their growing pains and that the rest of the starting pitching free agent market consists of a putrid soup of Rodrigo Lopezs, Bruce Chens and Brad Penney’s, a trade might be the best/only option. And of course, this isn’t even the biggest Yankee off-season problem. No, that problem belongs to whomever the Yankees hire as pitching coach: fixing A.J. Burnett. Good luck to whomever gets that problem handed on his plate. I think the Yankees should operate under the assumption that Burnett is unfixable and should be a number 5 starter at best. Maybe he's a bullpen project. Maybe they tell him that he will pitch no more than 2 innings out of the pen and he can let it all hang out. P-Cat, you're right about Grienke. The NY media and, even worse, the fans could very well whittle Zach's confidence quickly and permanently. It's a risky pursuit. Lee is priority one, and if that doesn't go the Yanks' way early, then you are absolutely right about the trade market. They should get a little creative and bolster the rotation. These scenarios are ridiculous...and btw Zach Mcallister isn't even in the organization any more.